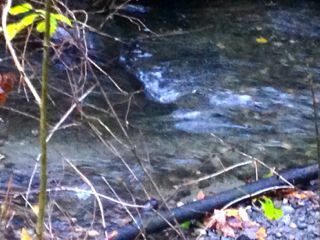 Chum salmon are running up nearby Piper’s Creek and I hiked down to see them. It’s always impressive to see large fish in a stream that, in places, is about three inches deep and only several feet across. The salmon announce themselves as they battle through the shallows with steady splashing. There were quite a number of them and volunteers have put a lot of effort into cleaning up the creek and making it more fish friendly. While I was there the sun peaked out. It’s been really soggy lately so it was a treat. I continued down the creek until it reached the beach that you get to via an overpass because the rail lines run right along the water on their way to Vancouver, B.C. From the overpass I could see that the south end of the Olympic Mountains were peaking through a temporary break in the clouds. It was my first sighting of fresh snow since last February or March. The tide was low and a lot of the creek was exposed as well as a lot of beach. 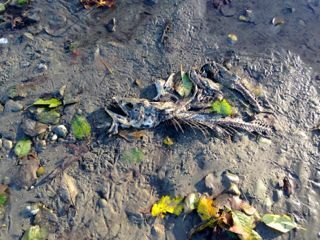 Crows and gulls lined the creek feeding on salmon carcasses. There were five other people besides myself. 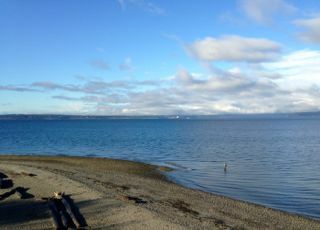 One was a fisherman waist deep in Puget Sound using a fly rod to try to hook a fish before it reached fresh water. The other four were scattered up and down the beach, mostly sitting on the massive logs that have ended up buried in the sand over a period of years. With the only sun of the week, and the mountains and salt water as a backdrop, every single one of them was staring down at their cell phones sitting with their backs to the sun in order to shade the screens. Can you spot the two salmon in the stream? Crows were still working this one over but flitted off a few feet as I inspected it.